Susan Orlean. Ballantine Books, New York, 1998 (printed as a paperback in 2000). Some of the best-written books about science appear first as long articles in The New Yorker, as this one did. Written by a young staff writer, it starts out as a straight forward bit of reporting about a man convicted of stealing wild orchids from a swamp in South Florida. 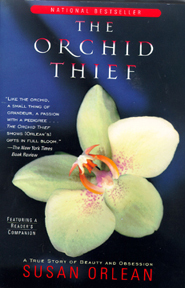 But as the reporter, Orlean, delves more deeply into this bizarre story, she becomes ever more fascinated with the arcane world of orchid collectors. The book is really about the fierce, dark, and often hilarious nature of obsession. It ranges widely through the classification of orchids, the ecology of the South Florida everglades, the history of Seminole indians and Florida real estate con men, and the loony subculture of orchid collecting. Orlean is not only a super reporter, but a poet who writes with passion. Like all really good reporters, she solidly grounds every word she writes in her own experience, sprinkling in priceless one-liners: “I hate hiking with convicts carrying machetes.” Every page of this book is a delight.